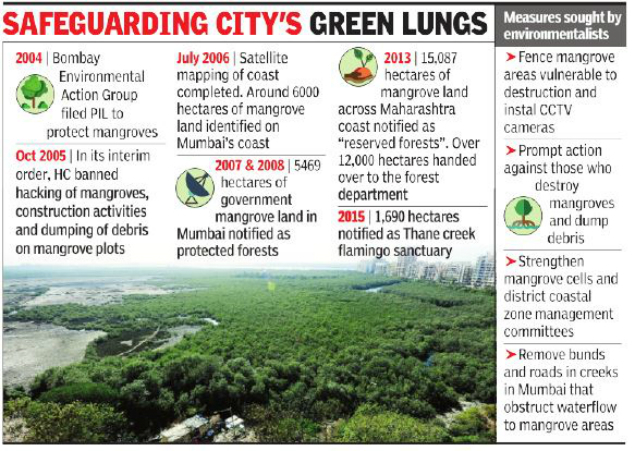 MUMBAI: Twelve years after its interim protective orders to save mangroves, the Bombay high court will pass its final orders in the matter. A division bench of Justice Abhay Oka and Justice Riyaz Chagla on Thursday reserved its judgement on the PIL filed by Bombay Environmental Action Group (BEAG). Since the landmark October 2005 order, the state said it has notified over 15,087 hectares of mangrove land in the seven coastal districts as “reserved forests” and replanted mangroves on over 541 hectares of land. The October 2005 order had banned destruction of mangroves, dumping of debris on mangrove lands. In an affidavit, Milind Pandit, divisional forest officer, Mumbai Mangrove Unit, said that since the court orders the government’s “multi-pronged action had led to a substantial increase in the mangrove cover of the state”. Pandit pointed out that the mangrove cover, which had remained stagnant between 2005-2013 at 181 sq km had increased to 304 sq km. Following the HC orders, the state carried out satellite mapping of mangroves and identified 5,469 hectares of mangroves on government land, which were notified as “protected forests”. The satellite mapping was carried out for the rest of the state and 15,087 hectares was notified. However, only 81% of the mangrove land was handed over to the Forest department, while 2,823 hectares are remaining to be given for protection. The state has sought six months to complete the transfer of remaining forest land to the forest department. In addition, 1,775 hectares of private mangrove land was declared as forests. Mumbai’s mangrove cell has cleared over 3,800 illegal structures on mangrove land and undertaken mangrove plantation on 541 hectares, the affidavit said. “A coastal and marine biodiversity centre has been set up at Airoli and the state has also constituted a Mangrove and Marine Biodiversity Conservation Foundation,” said the affidavit. Senior advocate Navroze Seervai, counsel for BEAG, pointed out that destruction of mangroves and dumping of debris continues unabated. “Dumping of debris on mangroves is still continuing in areas like Lokhandwala, BKC and Kanjurmarg. The major culprit is the BMC,” stated the BEAG in a note submitted to the court.